Volkswagen case studies: we currently have 3. In German, Volkswagen literally translates as "People's Car". To boost its brand in one if the largest and most competitive markets, the car maker started a novel social media campaign in China that let people create and vote for their favourite car designs. This case study looks at how Volkswagen managed to generate 33 million website visits and over 200,000 car designs, extending a year-long campaign into a long running project. 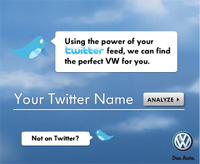 Volkswagen used YouTube video ads in a smart and fun way to create curiosity amongst viewers and lead them to engage with the brand. The ad was short and fast that the viewer could not skip and would be curious to know more about the advert. This was supported with an InVideo banner redirecting the viewer to the new Golf GTI’s website. The YouTube 5 second wait to skip ad turned around as a benefit by the brand and created the fastest ad on YouTube to create curiosity. Volkswagen Golf GTI - "Click if you can" case from DDB España on Vimeo.